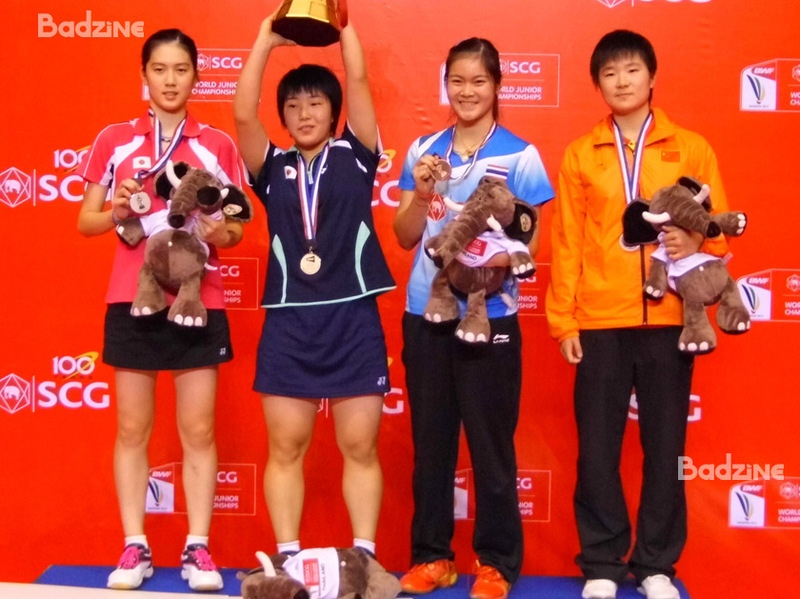 Chae Yoo Jung / Kim Ji Won took Korea’s 3rd straight girls’ doubles title at the World Junior Championships as both they and Heo Kwang Hee exacted a little payback against players who’d beaten them earlier this year. Story and photos: Gerald Jew, Badzine Correspondent live in Bangkok. 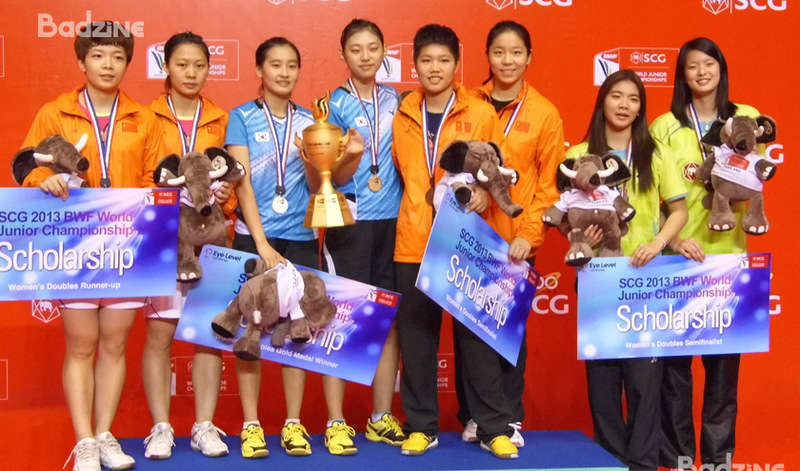 The SGC BWF 2013 World Junior Championships reached its conclusion on Sunday in Bangkok, with Korea winning the boys’ singles and girls’ doubles disciplines to add to its mixed team gold. Meanwhile, China won the mixed and boys’ doubles and Japan took home the gold in the girls’ singles, after dominating that final for a second straight year. 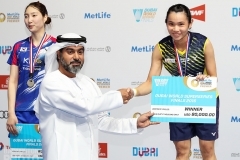 The individual stage of the BWF World Junior Championships, also known as the Eye Level Cups, kicked off with the mixed doubles. 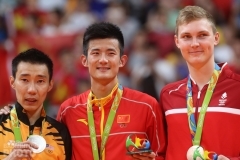 Indonesia’s Kevin Sanjaya Sukamuljo and Masita Mahmudin, the 9/16 seeds, were looking to repeat their victory in last week’s Suhandinata Cup team event over the 3/4 seeded Chinese team of Huang Kaixiang and Chen Qingchen (pictured below). 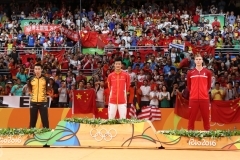 On Sunday however, the Indonesian pair weren’t able to complete their sweep of the Chinese team, losing in a tough three-game match. After splitting the first two games, the Chinese pair was able to finally complete their win in a back and forth 3rd game that was tied 11 times. 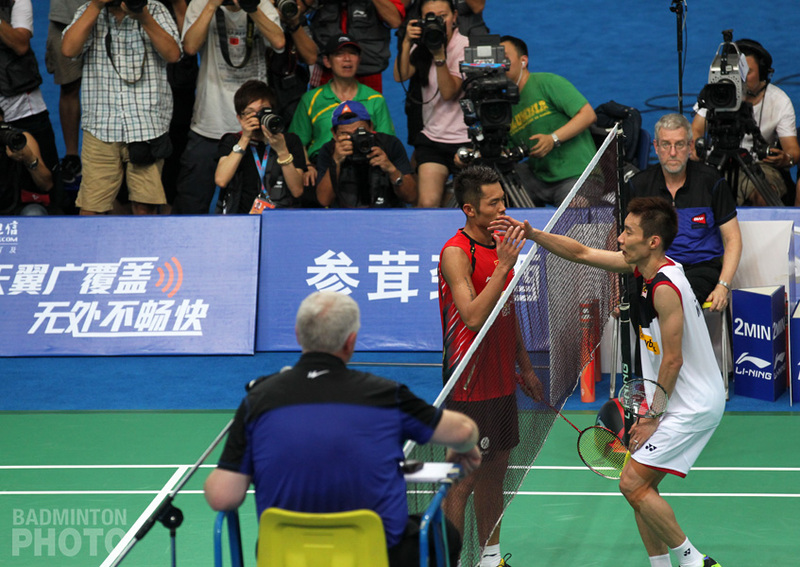 After failing to convert match points at 20-19 and 21-20, Huang and Chen closed out the victory by winning the last two points to win the game and match, 23-21. 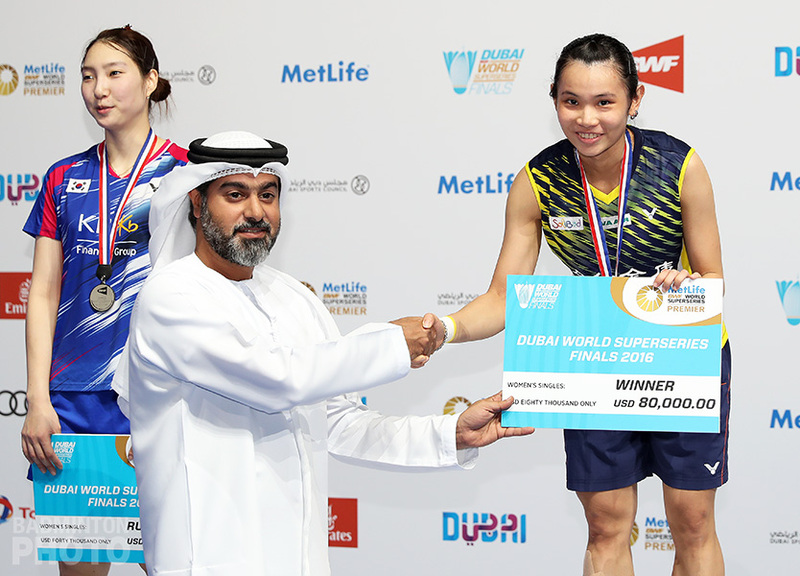 Japan Open Superseries winner Akane Yamaguchi, who disappointed the hometown fans by defeating Busanan Ongbamrungphan on Saturday, beat fellow Japanese team-mate Aya Ohori in a match that was never in doubt. Yamaguchi jumped out to a big lead in the first game and never looked back. In the second game, Ohori managed to keep the game close early, but after leading 13-12, Yamaguchi allowed Ohori just one more point on her way to the victory podium. After the match, Yamaguchi said, “Just like when I won the Japan Open, (the victory) seems like it really didn’t happen. It doesn’t seem real, it’s like a good dream. 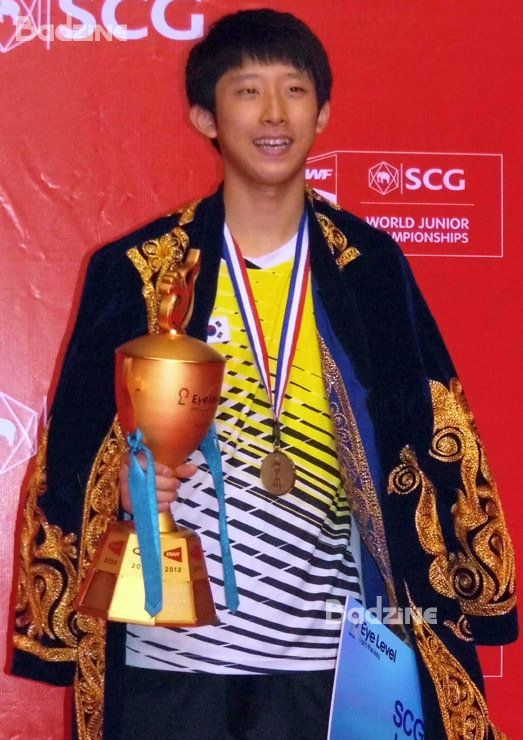 In the boys’ singles, Korea’s Heo Kwang Hee (pictured below) avenged his loss to Chinese Taipei’s Wang Tzu Wei in this year’s Asian Junior Championship team event. Heo played superb defense, and smashed at every opportunity to take the relatively easy win, 21-11, 21-12. Korea gained their 2nd victory of the afternoon in the girls’ doubles when Chae Yoo Jung and Kim Ji Won (pictured top) defeated China’s 2nd seeded Chen Qingchen and He Jiaxin, the pair that had eliminated them in the Asian Junior Championship semi-final. In a see-saw 2nd game that was tied at 13, the Korean pair then asserted themselves, allowing the Chinese team only two more points the rest of the way. 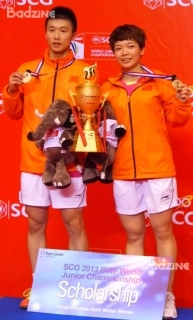 The Koreans thus extended their streak of girls’ doubles titles to 3, after the back-to-back wins by Lee So Hee and Shin Seung Chan. Chae is also Korea’s second second-generation national team player to win a World Junior title, after Yoo Hyun Young in 2006. In the boys’ doubles, top-seeded Li Jinhui and Liu Yuchen of China faced off against 5/8 seeded compatriots Huang Kaixiang and Zheng Si Wei. 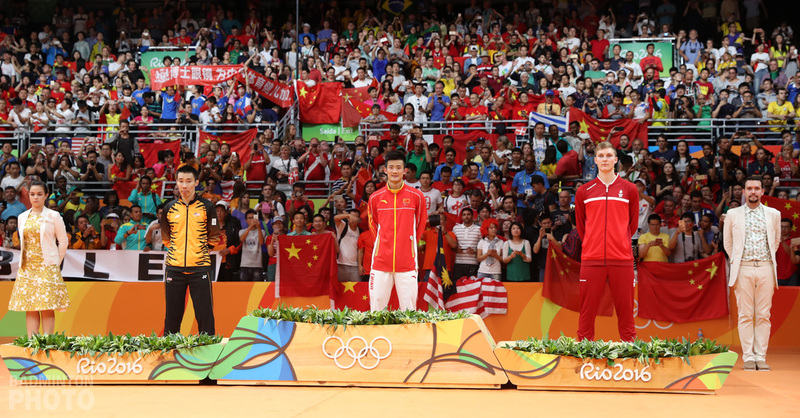 In a rematch of the Asian Junior Championships boys’ doubles final where Li and Liu won in straight games, Li and Liu had a much tougher time this time around, but held on to beat Huang and Zheng in three games.